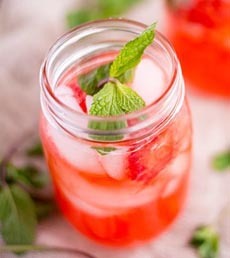 A fun mocktail is a treat for non-drinkers. Top photo courtesy Ocean Spray. Bottom photo courtesy ASweetPeaChef.com. If you serve alcohol at parties, you’re bound to have some non-drinkers, designated drivers, and probably, drinkers who shouldn’t have another. Most hosts address the need with soft drinks and mineral water. But special occasions merit an extra step: a holiday mocktail. It’s easy to make it look and taste interesting, and those who can’t drink will feel special. For your Christmas mocktail, we suggest something red and green: a red- or rosy-hued drink with a green garnish. Determine on the proportions, e.g. 2 parts cranberry juice and 1 part soft drink. Decide if you want to serve a tall or short drink. Consider a low-calorie option: The juice and soft drink ingredients both have diet versions, which will be especially appreciated by calorie-counting guests. 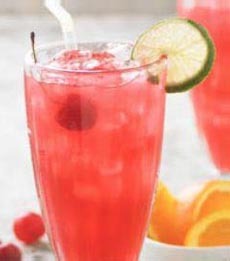 You can make the drinks a deeper red color with grenadine. *Our favorite cranberry juice is Knudsen’s. Ocean Spray has several 100% juice flavors: plain or blended with blueberry-blackberry, cherry, grape, orange, pomegranate, raspberry, etc. Use 100% juice instead of “juice cocktails” or “juice drinks,” which are typically sweetened with high fructose corn syrup. †The best maraschino cherries by far are the all-natural (and kosher-certified) Tillen Farms Merry Maraschino Cherries. They are “maraschino red” in color but taste great—nothing like the traditional varieties. The company also makes Bada Bing Cherries, with the deep burgundy hue of bing cherries. If you buy multiple packs online, use the extras as stocking stuffers. ‡San Pellegrino Aranciata (orange) and Aranciata Rossa (blood orange), and Boylan’s Orange, are the only ones we’ve found that use sugar instead of high fructose corn syrup. San Pellegrino is less sweet and more elegant; Boylan’s is conventionally sweet.